Some months back I received an email from Boris, a Rostov based electronic composer, DJ and sound engineer. He’d come across my music on Betoni and via email and IM we got to know each other a little. We promised to send each other some of our music. I put him onto a bunch of MP3s of my recent work and I had a couple of his. 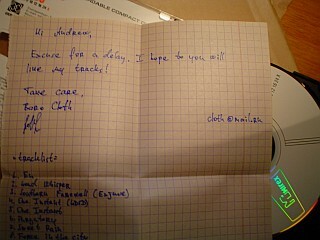 Not so long ago he told me he’d sent off a CD and that I should expect it soon. 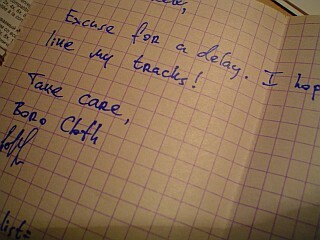 The package arrived as registered mail so I had to sign for it at the Post Office. 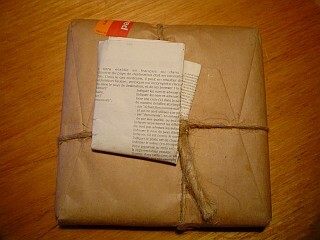 It was bound with string and wrapped in a heavy brown paper. Quite an old world feel. Reminded me of post offices in Prague where I’d met the harsh end of Czech’s bureaucratic nature… Kafka was right! 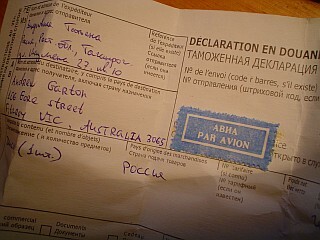 The rear of the package came with two copies of a signed customs deceleration document in Russian and French. 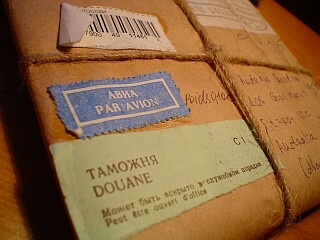 Boris’s handwriting, as on the front of the package, is some how similar to my Grandmother’s handwritten cyrilic. 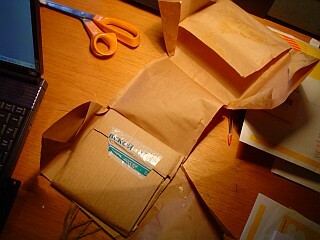 The packaging peeled back effortlessly, a rubber based glue to keep fast the paper. Lovely stuff. Thanks Boris… the best is yet to come 🙂 Tonight we play the CD! Heaps of birthdays to you! Surely you must have been born more than once!! The Cuban Missile Crisis occured Oct 18-29, 1962 but historical correctness aside, your mother sure fired one hell of a missile of her own into the world!! This fine day it would be desirable to wish musical creative successes, it’s many-many love and certainly health.. without which will not be neither that, nor another! p.s. it’s twice good, that the cd has come on your birthday! :) pleasant listening! Wow – what a beautiful way to receive a gift that can so easily be sent via the ether. 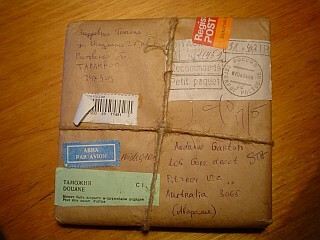 It reminds me of the parcels we received in return for the “Care Packages” we sent East German relatives in the early 1980s. Enjoy!